The pathetic one-scene-wedding in the first episode, and then THIS? It makes me wonder just what the writers have against beautiful weddings! They are men, which should explain the whole problem with what you mention, Lisa. I honestly thought this could be a turning point for Edith's character, now I'm curious what else they can do to her. I had one disappear today, too, Melissa. Sometimes they just go missing without explanation - it's a board glitch. Debbie - good luck! That's why I'm trying VERY hard not to post any details or spoilers here or anywhere else. I know several people who are just starting the series, and I don't want to spoil things for them. I accidentally read a HUGE, AWFUL spoiler for season three, and I've been nursing a broken heart even since. Just watched last night's episode. Cheryl, feel free to PM me if you ever want to talk Downton! Lisa & I have realized that it's impossible not to talk about it!! Rob, time to catch up, mister!! I'm glad they do repeats like 3:00 am in the morning. What episode was this last night? Episode 2, season 3. Also, for future reference, if you ever miss an episode go to PBS.com and you can watch it on there, at least for a brief time period. I accidentally read a HUGE, AWFUL spoiler for season three, and I've been nursing a broken heart even since. Me too. I wish there wasn't such a lag between it airing in the U.K. and here, but PBS likes it to air when it does. I 'like' Downton Abbey on fb but have hidden it until I can catch up to where they are across the pond. And I'm also on a European board (Cheryl, I'm speaking of Doc & Ella, from the DQ board? 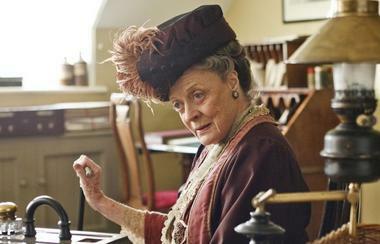 )....it's a great Downton forum, but I'm not going there either until I catch up to all of them! P.S. Cheryl, I sent you a PM. They are men, which should explain the whole problem with what you mention, Lisa. That has GOT to be it!! Debbie, I wasn't hooked right away. It took me a good 3 or 4 episodes to really find my rythym with the show. Also, there are a couple of plot points that I was worried about and was glad to see they veered away from. So, this is for anyone who may want to get into the show: in my opinion it takes a few episodes to really grab on to it. But once you do, you're hooked for good. Debbie, keep us posted on how you're liking it as the show progresses! I just finished the third episode of the first season. To be honest, after the first episode I wasn't so sure about it, but now I am really starting to enjoy it. Debbie, I'd have been the same way, but Amy forewarned me about a couple of elements that were in that first episode, and then are nicely dropped. It still took me a couple of episodes to really get into it - but after that I was hooked. Maggie Smith has won the Golden Globe for best supporting television actress for her part in the Masterpiece series "Downton Abbey." Carol, if you only check out one episode, make it midway into the series. The first two episodes aren't an accurate reflection of how good the series is. And YES! How cool that Maggie won! I love her character! I have to admit, I was hooked right away, but I don't think I saw a season 2 episode first, then went back and watched the previous ones to catch up. I've shared this before, but I'll do so again....it's totally worth the viewing! No doubt about it, Maggie makes the show! I have never watched this show but am willing to give it a try. I don't have Netflix, is there anywhere online that I can watch past seasons? I think they only show the current season online (pbs), Marilyn....bummer. But I do know the 1st and 2nd seasons on dvd are really quite cheap. My friend said she saw season 1 at Target for $5.00! So keep an eye out. Oh, maybe check Hulu? That's a possibility. Marilyn, Downtown Abbey is on tv link. Just search Downtown Abbey. Click on it. They have Seasons 1 & Seasons 2. Click Season 1 episode 1. Click on view all. To get the free links. Some of them require a plugin. I just finished season 1 last night and I am SO hooked! It doesn't look like Netflix has season 2 so I guess I'll have to sign up for Hulu to see it. I just finished season 1 last night and I am SO hooked! It has a way of doing that! I don't see it there anymore, but PBS's website had a quick preview of a scene between Matthew and Mary from tonight's episode. I think it's sad Mary and Matthew are at odds over when to have children.